As I sit with a tube in my mouth and a creative forming cloud of smoke coming out the other end I wonder how odd I must look. 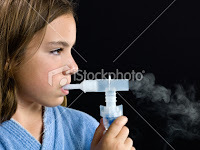 The machine I'm currently connected to is called a nebulizer. It is a funny little device that used to administer medication in the form of a mist inhaled into the lungs. Here's a picture of what it looks like (not me of course...stock photography in this case). Currently that medicine is Albuterol, which for those of you like me that don't know, albuterol is a bronchodilator that relaxes muscles in the airways and increases air flow to the lungs. I'm doing these treatments because I ended up with bronchitis after I came down with the flu. Trust me, I'd take the flu over bronchitis any day because not being able to breath makes everything HARD, even recovering from being sick. A cough is one thing, but never really catching my breath is another. Recently I was invited to a luncheon to learn more about a new product developed here in Utah. It's called Zarbees Children's Cough Syrup. Wait, it's All Natural, gluten free, soothes sore throats, immune boosting formula, safe for children 12 months and up. You might have even started to see it on the shelves at your local Walgreens stores too! 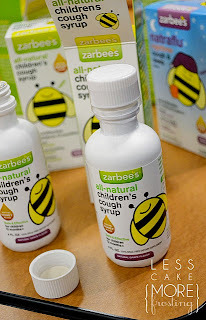 Zarbee's Cough Syrup contains a blend of special dark honeys, vitamins and immune-bosting ingredients. The ingredients in Zarbee's are all-natural, side-effect-free and proven in clinical trials to be effective at calming coughs and sore throats in children and young adults. Aren't these the cutest ever? I have no idea who came up with the idea, but they were delivered last night to my daughter the day before her 14th birthday by some friends. And being the Glee-k that I am couldn't resist sharing. Glee Slushee Cupcakes...too cute! First lets talk more about the cupcakes. They're actual yellow cupcakes sitting inside the tops of a plastic cups. they sprinkled colored sugar over the tops to make it look like the famous colored slushees every gets in the face on Glee and then stuck fruit licorice in for straws. Oh and love the labels...so cute! But here's what happened to my daughter when she opened the front door to her friends.... They "slusheed" her in the face...make sure to not get in her newly washed hair or on her jammies (thanks guys). The sign is of Puck I think was a card. And here are the culprits that brought a little Glee Sunshine to our home last night. Happy Birthday Emma...we love you! Decorating with SpoolsMy very talented friend Kristine McKay did one of my most favorite Studio 5 segment to date. She showed some great decorating ideas with SPOOLS. Learn how easy it is to knock off this popular trend seen at stores like Ballard and Pottery Barn. On a side note, I watch crafty shows like this and think they're cute, but very seldom feel inspired to recreate them...but not with this one. I'm heading to Hobby Lobby tomorrow to buy the supplies. I especially loved that Kristine posts free downloads for the labels on the spools on her website. Felted Crocheted SlippersI found these one day on Etsy and not many things make me want to crochet, but this gal was selling the pattern for these and I almost bought it. How darling are these cute little slippers? If any of you want to teach me to crochet, I'll buy the pattern for us to use.